Mr. Hopingstone Lyngdoh, MLA of Nongstoin Constituency in Meghalaya passed away in the early hours (12:45 AM) of September 26, 2015. He was 88. He entered active politics in 1957 to stand for District Council elections of erstwhile United Khasi & Jaintia Autonomous District Council. Ever since, he had never lost an election. He entered the then composite Assam Legislative Assembly as an elected MLA in 1962. When Meghalaya State was created in 1972, he was elected as an MLA from Pariong Constituency. 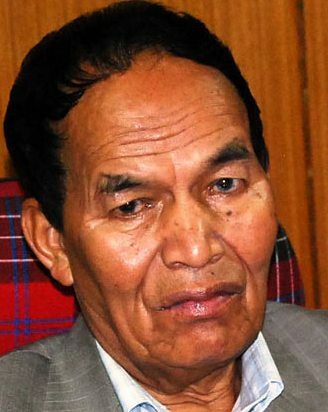 In 1977, he stood for Parliamentary Elections from Shillong and defeated Prof. G. G. Swell, former Lok Sabha Dy. Speaker, Mr. P.R. Kyndiah who later became Speaker of Meghalaya Legislative Assembly, Governor of Mizoram and Union Minister and, Prof. P. G. Marbaniang who later became Speaker of Meghalaya Legislative Assembly and MP. Mr. Lyngdoh was Executive Member of the UKJHADC, Chief Executive Member of Khasi Hills Autonomous District Council (KHADC) and Dy. Chief Minister of Meghalaya on different occasions. The World Council of Churches calls the global churches and faith communities to observe the International Day of Prayer for Peace on the 21 September which is also the United Nations-sponsored International Day of Peace. The Commission on Justice, Peace and Creation of the National Council of Churches in India joining its members in observing the same by organizing special programmes, worships, candle light vigils and prayers and on 21 September every year to observe the International Prayer Day for Peace. The International Day of Prayer for Peace offers an opportunity for church and faith communities in all places to pray and act together to nurture lasting peace in the hearts of people, their families, communities and societies. The idea was proposed in 2004 during a meeting between WCC general and UN Secretary General and coincides with the UN International Day of Peace. This year, the Commission organises a special event on the theme ‘Peace and Dignity on Earth’ from Tribal and Adivasi perspective in Ranchi in partnership with Student Christian Movement of India – Bihar –Jharkhand Area, CNI – Ranchi Diocese HPTC and the Christian Service Agency on the 21st September 2015 (Monday). Dr. Sushant Agrawal, Director – CASA would be the Speaker and Bishop Taranath S Sagar, President is the Guest of Honour. Rev. Dr. Roger Gaikwad, General Secretary – NCCI and Mr. Inbaraj Jeyakumar, General Secretary – SCMI would also grace the occasion. A Tribal Student Group will perform cultural items on the theme. The Commission also requests all the members Churches, Institutions and the Regional Council to observe this ‘International Prayer Day for Peace. The International Payer Day for Peace is a day on which armed conflict is meant to be stilled, a day for combatants to observe cease-fires, a day on which all people are invited to commit or reaffirm their commitment to non-violence and the peaceful resolution of disputes. Let us join our prayers together to pray for the world peace by remembering the victims of the conflicts globally and locally. Let us also take-up the peace making ministry as part of our mission agenda. Applications are invited from interested candidates to serve as Executive Secretary NCCI Commission on Youth. The candidate must belong to a Member Church of NCCI and should have a commitment to Youth concerns. The appointment will be for a term of five years beginning from 4th January 2016. Applications are invited from interested candidates to serve as Executive Secretary in-charge of the NCCI Commissions on Dalits and Tribals/Adivasis. The candidate must belong to a Member Church of NCCI and should have a commitment to Dalit and Tribal/ Adivasi concerns. The appointment will be for a term of five years beginning from 1st December 2015. NCCI-URM and VCLC responded to this burning issue by visiting and being in solidarity with the families of farmers residing in the Turakmari, Butibori area on the 7th of July, 2015. Dr.Roger Gaikwad, General Secretary of NCCI, Pranita, Intern of the URM, Sanjay Wankhede Support Staff and VCLC Coordinator Rajesh Jadhav had a in-depth analysis with and among themselves. In a bizarre development, seven debt-ridden farmers, among them three women, in Maharashtra's Wardha district have sought the administration's "permission" to commit suicide. "The situation has become so bad that these seven peasants have approached the district officials requesting their green signal to end their lives," said Kishore Tiwari, president of the Vidarbha Jan Andolan Samiti, an NGO working for farmers' rights. 2015 is the Birth Centenary year of the late Dr. M. M. Thomas a globally renowned Church Man, Ecumenist, Christian Theologian, Socialist and Humanist. To offer an ecumenical tribute to this great person, the National Council of Churches in India, along with CASA and in partnership with CISRS, ECC and SCMI organized a Dr. M M Thomas Birth Centenary Public Lecture on 24th August 2015 at ECC Bangalore, on the theme ‘Democracy and Inclusive Governance’.